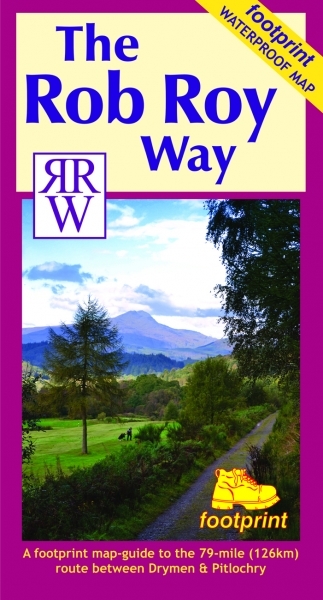 The Rob Roy Way is one of Scotland's 'Great Trails' and runs for nearly 80 miles between Drymen, near Loch Lomond north of Glasgow, and Pitlochry at the heart of Highland Perthshire. As it traverses the country, it passes many places associated with the eighteenth century outlaw Rob Roy Macgregor.This is the first in a new series of large-format, large-scale maps of the popular Footprint series of waterproof long-distance path maps.The new clear mapping style, and the new larger scale of 1:40,000, allows even easier navigation than ever before on a Footprint map. The new larger sheet size is still easy to unfold and re-fold outside, but it allows more space for the new maps and other information useful when planning a trip, or when walking the trail.